“A Tribute to Frank and Dean is a superior sound-alike and lookalike attraction featuring Anthony Adams as Sinatra and Neil Duncan as Martin. 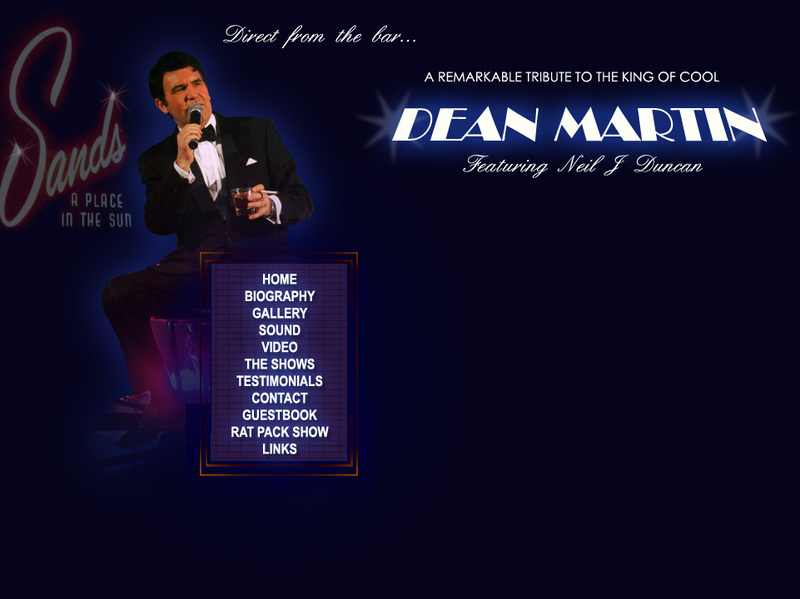 AND HE WAS ABSOLUTLEY AMAZING ALL OUR CLIENTS ENJOY THE NIGHT WITH MR NEIL DUNCAN SO WE HAVE BOOKED HIM TO PERFORM HERE AGAIN ON 28TH OF APRIL.LOOK FORWARD TO HAVE DEAN MARTIN HERE AGAIN. Steve - Restaurant Terracotta, Cranbrook. Firstly can I say that the other evening was fantastic – we all really enjoyed the show and I think it was our best ‘special evening’ yet. We’ve had lots of positive feedback from customers and I know that many of them asked for your card, so hopefully you enjoyed the evening too. We would like to try and organise another one before Christmas, so are you free on Wednesday 10 November? If you can let me know that would be great. I have booked Neil Duncan for his Dean and Elvis Show several times over the past 6 years. He is always very punctual and polite. He uses very good sound equipment which is ideal in an intimate restaurant setting. We always sell out for his shows and they are always a huge success as well as profitable. Neil captures Dean and Elvis extremely well but does not take himself too seriously which all adds to a great night of entertainment. I will continue to book Neil at The Eliachi as I can always sell tickets well in advance. Marc Perkins landlord - The Prince of Wales, Hoath , Kent. Trudi Kingman, Artistic Director, Granville Theatre. Restaurant Manager – Lord Bute Hotel and Restaurant, Highfield, Bournemouth. Theatre Manager – Tivoli Theatre, Wimborne. The wedding day went without any problems and I must say that Neil as Dean Martin was fabulous. He is a great entertainer and the whole show was a great success. He added so many nice touches, especially getting the bride and bridesmaids up to be his backing singers on the song "Things", that was just brilliant!!! He is genuinely a lovely man with a good voice and sense of humour!! Would I recommend him? Definitely. Would I use him again? I wouldn't hesitate. I would recommend him to anyone wanting that little extra for their event. Thank you for your help in supplying him. The whole process of booking the act was very easy.